The following are excerpts/condensations of portions of the book, THE MISPLACED AMERICAN, which was compiled and edited by Ursula Vogt Potter and published by 1stBooks Library (now AuthorHouse) in 2003. These excerpts/condensations have to do with the sections of the book relating to the internment of Karl Friedrich Vogt from Dec. 9, 1941 until August 20, 1943. I’m not sure what is real memory and what is second hand memory for me. I was very young when it happened—I was 13 months old. 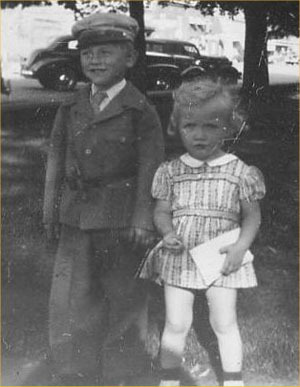 My brother, Armin, had turned four on October 28, 1941, so his recollection is probably more real than mine. I do think that I remember my mother standing by the big round oak dining table and crying. My brother remembers the scene by the table with the two strangers, by then identified as FBI agents, removing pictures from the family album and taking them, along with my father, off to places unknown to us. This happened late afternoon on December 9, 1941, two days after the Japanese attack on Pearl Harbor, one day after the U.S. declared war on Japan and two days before the U.S. declared war on Germany. The next clear memory I have is of my dad coming home sometime during the month of August 1943. Karl Friedrich Vogt, my father, was born on February 18, 1906, the firstborn of Kasper and Anna Marie at Dunne near Bunde in Westfalen, Germany. He was the oldest of eight children— three boys and five girls. In 1923, Kasper, Anna Marie and their children decided to immigrate to America. An old uncle had been begging Kasper for years to come to America and take over the uncle’s small farm, which was located south of Spokane in the fertile Palouse country of eastern Washington State. They left Germany on April 9, 1923 and arrived in Spokane on May 1. Soon after their arrival on the farm, the family realized that conditions were not as rosy as the uncle had painted them. The farm was run down and debt ridden, making it necessary for Kasper and his two older sons, Karl (my dad) and Wilhelm (Bill), to work at outside jobs until the farm became productive enough to support the family. My father, Karl, met my mother, Elsie Reifenberger, in 1924 at Zion Lutheran Church in the neighboring community of Fairfield, Washington. Elsie and her siblings were born in America, but her father and mother had emigrated from Germany in the late 1800s. The two families, the Vogts and the Reifenbergers, became good friends. Elsie’s mother had died when she was only six years old, so Jenny Gelber, a cousin who was a nurse in Germany, had been persuaded to come to America to help raise Elsie and her sisters. Later, after Elsie graduated from college and had taught school for several years, she and Karl fell in love and became engaged. At this time it was decided that Karl and Bill would remain in America and the rest of the Vogt family would return to Germany. Employment opportunities for the younger Vogt siblings were now better in Germany than here in America. Also, the family had kept their small German landholding, renting it out while here in America, making it easier to resume their lives in Germany. 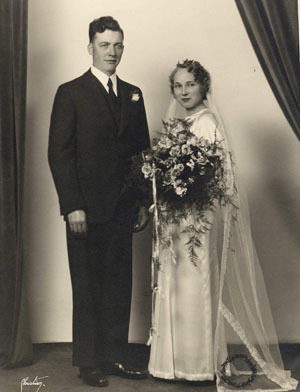 Elsie and Karl were married on October 20, 1935 and a few days later the remaining Vogts (except for Bill) began their journey back to Germany. The next spring, 1936, Elsie and Karl took a delayed honeymoon trip to Germany. Most of the time there was spent visiting relatives, but they also took a short tour with a German-American group from Spokane. One of the people that they met on this tour was the editor of the Washington Post, a German-American newspaper in Spokane. His name was Heinrich Hesse. Karl kept in contact with Mr. Hesse after this trip and it was he who advised Karl and Bill to put the farm into Elsie’s name. Hesse told them, “You are not citizens, but Elsie was born here. They’ll take the land away from you if war starts with Germany.” Karl and Bill took his advice, hired a lawyer and the farm was sold to Elsie. When Elsie and Karl took their trip to Germany in 1936, Elsie’s cousin, Jenny, went with them. She had decided to return to her former home near Siegen in Northern Germany. The Reifenberger girls were adults now and no longer needed her, and she had a sister in Germany who was ill and needed Jenny’s help. While she was here in America, Jenny had managed to build up savings in the Fidelity Bank in Spokane. During the Depression the account was blocked, but later the bank paid out a certain amount each year. Jenny gave Elsie and Karl Power of Attorney in 1936, so when the Fidelity made these payments, they cashed the checks and sent the money to Jenny by money order. When the war broke out between Britain and Germany, they knew that it would not be safe to send it the regular way any longer. Someone suggested that they should send the money to the German Consulate in San Francisco. There the Consulate would keep the American dollars for its own expenses and pay out the sum in German marks to Jenny in Germany. Karl did just that, and a couple of weeks later received a paper signed by Jenny stating that she had been paid the money. When Pearl Harbor was attacked, the Consulate was raided and Karl’s letter was evidently found. Later, it was revealed that the head of the Consulate from 1939 until July 1941 (Capt. Fritz Wiedemann) had been involved in espionage activities and was expelled from this country late in the summer of 1941. After Karl was “arrested” and he had a “so called” hearing, some of the above events were held against him. “Why did your family go back to Germany? Why did you sell the farm to your wife? Why did you take a trip to Germany in 1936? Why did you send money to Hitler?” were some of the questions posed to him over and over. It never occurred to him that the basis for the money question was the money he had sent to Jenny Gelber. 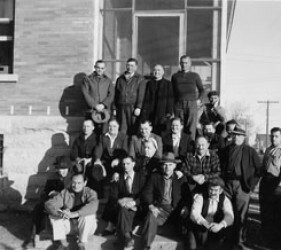 I was held in the county jail until December 21, 1941 when they finally shipped me off to Fort Lincoln, Bismarck, North Dakota. The train which picked me up in Spokane and took me to North Dakota originated in California and had, on this sad pre-Christmas journey, also picked up men from all over the far west. At Fort Lincoln, on January 19, 1942, I had a “so called” hearing. I was not allowed to have an attorney and had to appear before the Enemy Alien Hearing Board of Eastern Washington. I was grilled for hours. Later on February 3, the hearing was completed in Spokane where witnesses and affidavits could be presented. I was not allowed to attend this part of the hearing. Many people testified or sent affidavits in my defense. Later I heard that three people had testified against me. We had land hungry neighbors who couldn’t wait to get their hands on the farm. Of course, they didn’t know that the farm had been turned over to Elsie. The Board chose to listen to the three and ignore the rest. Many of the men I met at Fort Lincoln were transferred with me to Camp McCoy and then finally to the “permanent” camp at Stringtown. They all had interesting stories to tell of their lives and the circumstances of their internments. One of my friends at Ft. Lincoln was Erich Braemer. 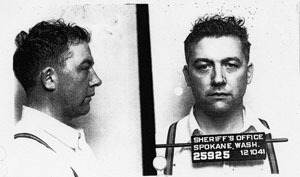 He and I were both from Washington State and both of us had been “arrested” on December 9, 1941. Erich was a friendly, interesting person whom I liked immediately. He told me that he had a son who was in the U.S. Army Air Corps. One day near the end of February 1942, the head of the camp called Erich to the office and told him he would be going home in a few weeks. Many of us were really excited about this, because we thought there might be some hope for us too. He promised that he would write and tell us why he had been released so suddenly. Later he sent news clippings from a Seattle, Washington newspaper. These news articles told about the Braemer son who had been part of the Doolittle Raid. General James Doolittle had led sixteen B-25 bombers from the deck of the U. S.S. Hornet (a feat in itself for the usually land based bombers) to a very dangerous surprise attack on Tokyo in April of 1942. Fred Braemer, Erich’s stepson, had been the bombardier on the lead airplane piloted by James Doolittle. Needless to say it would not do for the father of one of these brave men to be behind barbed wire in an internment camp! My other fellow internees were a cosmopolitan group. There were lawyers, engineers, professors, farmers, and sailors. There were a number of Austrian ski champions who happened to be working as instructors at places like Sun Valley and Aspen when the war broke out. There were two Lutheran ministers and several Catholics priests. One priest, Dr. Heinrich Hoffmann, had been a part of the library staff at the Vatican! He was in the U.S. studying our library system. He was one of my best friends in camp. Another good friend was Frank Wiegner, a diesel engine design engineer who, after the war, bought and operated an apple orchard near Chelan, Washington. Men were interned for many reasons. Most were German nationals who were in the U.S. for a variety of reasons at the outbreak of the war. 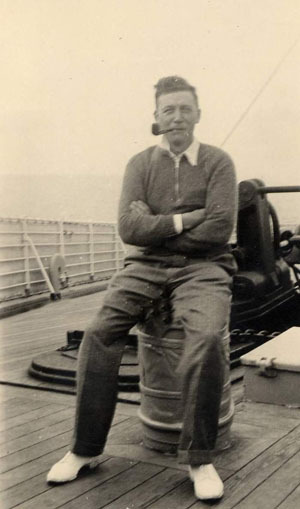 Some were visiting professors, some were students, and some were on the crews of ships. Some were there because of the ill will of neighbors or business associates. It was easy to accuse someone of being a Nazi! One Lutheran pastor was interned because he had objected to putting the Christian and American flags in the church: “The church is no place for flags.” He was labeled un-American and reported. There was even a small group of men from far away Samoa. Some of the Samoan islands, the eastern ones, belonged to the U.S., but before World War I, the western Samoan islands were a German colony. In 1914, New Zealand was given control of Western Samoa and later administered it under the auspices of The League of Nations and still later as a UN trusteeship until its independence in 1962. The internees from Samoa did not speak a word of German and had never been to Germany. Incredibly too, there were also people of German descent from Latin American countries in the internment camps. One of these fellows told me that he was working in the field one day when the authorities came to him, handcuffed him, placed him in a car and took him to a waiting ship bound for America. We internees ran our own camps under the direction of the camp commander. 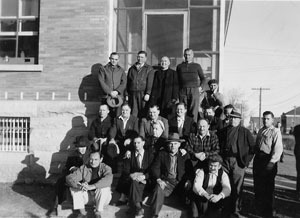 Group leaders, who were elected by the internees, were responsible for seeing that all of the camp rules were carried out. We did our own cooking, and at Stringtown, Rudy Wulff was the head cook. He had been a chef in one of New York’s finest hotel restaurants. I often worked with him when on K.P. duty. One day the colonel came to the kitchen and said, “I’m having a dickens of a time getting sauerkraut for you people every day.” He was very relieved when we assured him that we didn’t need sauerkraut all that often. I never had felt so alone, afraid and desolate as I did on the night of December 9, 1941 after the F.B.I. took Karl away. Our closest neighbor, Mrs. Keevy, came to stay with me and her brother, George Davis, did the chores. Little Ursula had not yet learned to walk and crawled around the house calling for “Da” She did this for days afterwards. Armin “cussed” those men quite vividly. 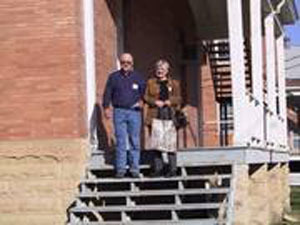 The next day, my sister, Rose, came to watch the children while Pastor Reitz took me to Spokane where we found that Karl was housed in the county jail. On the way home we stopped at Sacred Heart Hospital on the off chance that my brother-in-law, Bill, might still be there. He worked as an orderly there during the winter when things slowed down on the farm. We had assumed that all German nationals had been picked up and so were amazed when we found him at work there in the hospital. He immediately gave up his job and came home to the farm. While Karl was at Ft. Lincoln and Camp McCoy, we at least knew where he was and could write censored letters to each other. 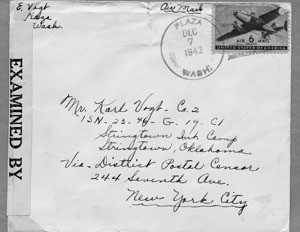 In April of 1942, Karl wrote that he was to be transferred to a “permanent camp” but didn’t know where. 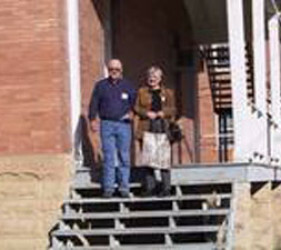 An attempt was made to keep the new place of detention secret from the internees’ families. We were given a New York address and all my mail to Karl was sent to this number: ISN-23-46-G-19-CI, Postal Censor, 244 Seventh Ave., N.Y. There was a terrific uproar from the families and the destination leaked out anyway, so thankfully this plan didn’t work out. For quite some time, however, mail was routed over New York for censorship and letters were weeks old before they reached their destinations. The “permanent camp” that Karl was transferred to from Camp McCoy turned out to be Stringtown Internment Camp, Stringtown, Oklahoma. He arrived there on June 17, 1942. Stringtown was also a prison camp for U. S. soldiers, which was entirely separate from the internment camp. Toward the last, at Camp McCoy, wives had been visiting their husbands, so Karl was longing for a visit from the children and me. When he was transferred to Stringtown, he found it was possible there too. Two visits a month were allowed, and if scheduled at the end of the month and the beginning of the next, we could have four days in a row. Arrangements were made and we left Spokane by train at the end of July. The first day of our visit was unbelievable! We were evidently the first visitors any internee had had, and they must have been expecting some real gangsters. Karl was brought under guard to a small building where an officer sat throughout our visit. At each door stood a soldier with his bayonet pointed toward us. Armin was highly interested and didn’t hesitate to voice a lot of questions: “Why are they pointing those guns at us? Why is Dad wearing such crummy clothes?” Anyway, I ignored the guards who looked embarrassed by this time, and Karl got reacquainted with Ursula, who, of course, was very shy with him at first. I was almost five years old when we visited Dad at Stringtown. I remember with absolute clarity the high fence and several strands of barbed wire at the top and the gate through which we had to pass inspection before we were allowed to enter. The guards all had rifles and side arms. The officers only carried side arms. An armed guard escorted us to a small one-room building. In the center of the room there was a small square table and four chairs. In the corner of the room was another chair that was occupied by an armed guard. There may have been another guard also, but I particularly remember the one in the corner because, on the first day of our visit, his rifle was held at ready. Literally pointed in our direction—not directly, but over our heads. On the second day of our visit this guard parked his weapon in the corner. I guess my curiosity regarding his weapon on the first day and my many questions regarding his gun were disconcerting to him. Dad did tell us later that the guards were unhappy about the situation. Guarding little kids with a rifle was too much for them. Dad also told us later about a nearly unbelievable incident that happened in the camp. A new guard was randomly assigned to guard an internee whose family was visiting him. This guard turned out to be the son of this internee! This, of course, caused quite a stir among the military personnel assigned to the camp. Karl went through the trauma of being an enemy internee and I went through the trauma of being the wife of an internee. This was a very bitter pill to swallow, especially considering that I had three nephews and a brother-in-law in the U.S. Armed Services, and knowing that Karl had done nothing to warrant this treatment. Further harassment awaited us. On January 21, 1942, we suddenly received an order from the Federal Reserve Bank of San Francisco blocking our bank account. We had to obtain a special license to carry on our farming operations. It took months to obtain the license and if hadn’t been for relatives who lent us money and business people who gave us credit, we would have been in real financial trouble. We hired Mr. Richard Munter as our attorney and he went all out for us. I spent many hours in his office. When we finally received the license, it was for $2,250.00 for six months. How we were expected to pay our debts, run a farm and live on that amount only Herbert Armstrong of the Federal Reserve Bank knew! Mr. Munter managed to secure us a larger license and we were soon able to operate as usual, except that every cent we spent had to be reported in triplicate to the Federal Reserve Bank. This was done through August of 1944; a year after Karl was released. In the winter of 1943, family camps were being established for our families and us internees, some in Texas and elsewhere. I wrote to Elsie and asked if she and the children would join me in Family Camp. She wrote back immediately and said, “Yes, please.” She was very tired of raising Armin and Ursula by herself and suggested that we could hire a housekeeper to help Bill on the farm. Soon after I received Elsie’s letter, an F.B.I. agent visited me. “Why did you send money to Hitler?” I was asked again. “I’ve never sent money to Hitler. I’ve never wanted to send money to Hitler. Why am I being asked this same old question again?” And then, “Did you send money to someone named Jenny Gelber through the German Consulate?” A light went on in my brain as I answered, “Yes, I did and let me tell you why.” Two weeks later he returned. “Your story checks out. You should ask for a rehearing.” I answered, “I’m not appearing before that ‘kangaroo court’ again.” He just laughed and said, “You’d better think it over. Get your wife to work on this.” I wrote to Elsie about what had happened. She was overjoyed and immediately started proceedings to obtain a rehearing for me. My rehearing was held in Spokane on March 23, 1943. Dozens of people—-business acquaintances, friends and relatives came to visit me and many were called in to testify. On the day of the hearing, we all met in a big room in the D.A.’s offices and could visit freely. The Board met in a smaller room next door and called witnesses one by one. The next day I was taken to Fort Missoula in Missoula, Montana to await the results of the hearing. The Board had recommended my release but the final approval had to come from Washington D.C. Fort Missoula was an internment camp for the Japanese and the Italians. I was the only German there. 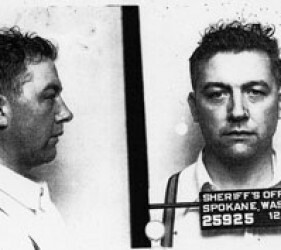 Mr. Connelly sent me to Missoula because it was near home and he expected me to be released soon. As it turned out, it was several months before I was finally allowed to go home. At Fort Missoula I made friends among the Italian and Japanese communities. One Japanese fellow had been the head chef at a fancy restaurant in Honolulu. “Surely,” he said, “this war will be over soon and I will be able to return to Honolulu. Then you and your family must come and visit me and I will prepare you a sumptuous feast!” Finally, On August 20, 1943, I was told to pack my bags—that I was going home. I arrived in Spokane that evening and was home on the farm late that night. What joyful reunion! We were a family again. Even more amazing, perhaps, is that my family on the other side of the ocean remained pro-American. My uncle Henry, who was in the Nazi army, saved the lives of a number of Jewish people, at great risk to himself. Near the end of the war, he positioned himself so that he was captured by the Americans, and because of his good command of the English language, was able to work for them as an interpreter. My Aunt Marta, who was a censor for the Germans during the war, began working as an interpreter for the Americans after they occupied the town where she resided. These connections with the Americans saved my European family from starvation—–a fate common to many Germans for several years after the war. Several stories about the experiences of Uncle Henry, Aunt Marta, Aunt Lisbeth and Aunt Mina in Germany during the war are told in the book, THE MISPLACED AMERICAN. As for me, I think that I have finally faced the anger that has been a part of me since 1941. I also have worked through the sense of abandonment that has lurked in my subconscious since the day my dad was suddenly taken away. Most of all, I have come to terms with what it means to be a German-American. During my whole life, it seems, the Germans have been the bad guys, and the message has often been, that not just Hitler and his crew, but all Germans are guilty of mass murder. Putting together the story of my family during World War II, learning about the stories of other internees as well as other people who lived through the War in Germany, has convinced me that most Germans, as well as most Japanese and Italians, were and are just as honorable as most Americans. My German family on both sides of the ocean did what they could to maintain their dignity and humanity amidst impossible circumstances. We can only hope that the world became a better place because of the lessons learned during the years 1941-1945.